Ald. Judy Fiske (1st) at a meeting. Fiske agreed that the proposed panhandling ordinance needed reform. 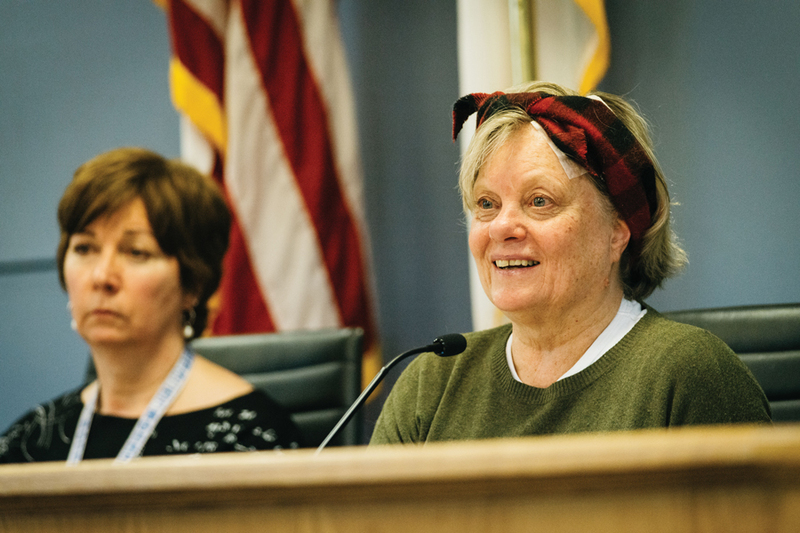 Aldermen delayed action on proposed additional regulations for panhandling at Monday’s Human Services Committee meeting, citing a need for further discussion of the issue. The proposed ordinance would enforce new regulations on location and behavior for panhandling and soliciting in Evanston. It also outlines different kinds of panhandling at varying degrees of aggression and proposes penalties in the form of fines or community service for citizens in violation of the new regulations. Ald. Cicely Fleming (9th) said she had serious reservations about the ordinance, including the proposed penalties and the potential for the ordinance to affect some citizens more harshly than others. Fleming added that she was concerned about limitations to First Amendment rights. The ordinance makes a distinction between passive panhandling, which was ruled by the U.S. Supreme Court in 2015 to be a form of free speech, and aggressive panhandling or “abusive solicitation.” The ordinance would ban all aggressive begging, panhandling and soliciting, while permitting passive acts except in areas determined to have heightened safety or personal privacy. Several community members spoke out against the ordinance during the public comment portion of the meeting, and aldermen decided to hold the ordinance in committee for further discussion and changes. Jackie Prince, who spoke during the public comment portion, said the ordinance failed to understand the motivations of people who panhandle, noting that it is often a last resort when official channels like shelters and non-profits aren’t enough. Prince added that panhandling can lead to compassion and understanding between people, and said that she personally has made many positive connections while panhandling. Doug Sharp, a member of Reclaim Evanston, said he opposes the ordinance because it would criminalize poverty. Although conversation at Monday’s meeting mainly concentrated on the ordinance as it would apply to individual citizens panhandling for themselves, the proposed regulations would also extend to political or charitable solicitation. Ald. Judy Fiske (1st) said she agreed the proposed ordinance needed reform, but also she feels something must be done to address the concerns of residents.